These incredible, hand made net posts are lovingly crafted, one at a time, in a small town in Argentina. They were designed in conjunction with Hamptons Tennis Company, Inc. by Raul Ballestero, an Argentinean craftsman, and are produced by him in his own small factory. 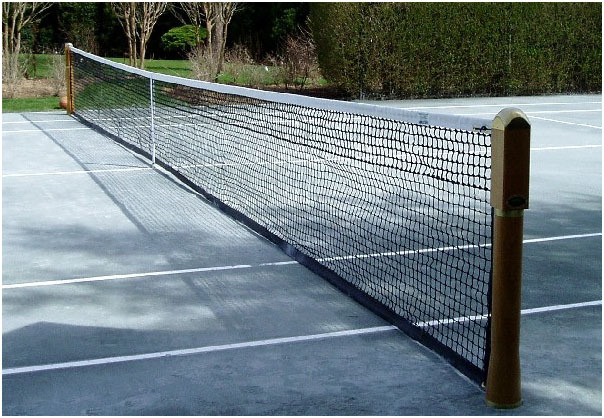 Manufactured using the highest quality materials, including bronze, aluminum and farm grown Brazilian hard wood, these net posts have been especially designed to withstand the considerable force of a fully tensioned net as well as resist the elements. 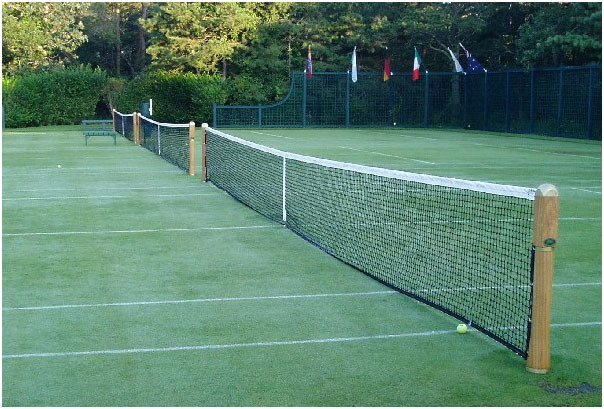 Extensive product testing, both in Argentina and the United States, has convinced us that these net posts will successfully resist the worst elements Mother Nature has to offer. The wood has been finely finished with 5 coats of a varnish formulated to withstand temperature extremes as well as UV rays. This attention to detail should ensure years of trouble free service. The cap is solid bronze, cast from a mold uniquely created for these posts. Each casting is mechanically smoothed, hand sanded and polished one by one, before a final 5 coat varnish finish is applied. The coating will gradually wear off allowing the bronze to age gracefully. The bronze cap protects the end grain wood at the top of the post from being exposed to the weather. A special bronze bottom ring plate protects the end grain on the bottom of the net posts from coming in contact with moisture from the court surface. The net posts are streamlined, utilizing an internal wind tensioning device. With this method, both ends of the net cable are hiddeninside the net posts. The winder handle is conveniently located next to the tensioning device, beneath the bronze cap. 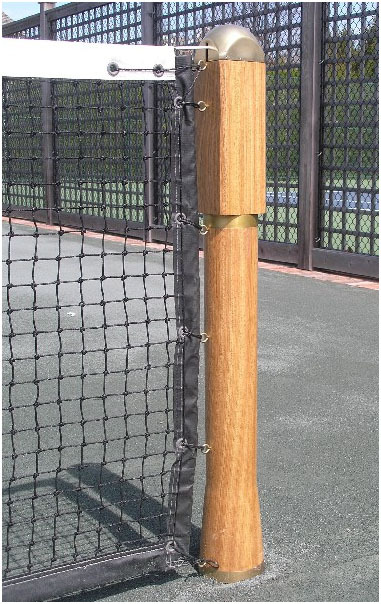 Hamptons Tennis Company, Inc. is proud to be the sole United States distributor of these fine net posts. All Net Posts are sold in Pairs. One pair is $5,995. For more informaiton, please call (631) 283-8244 or download the brochure with order form.